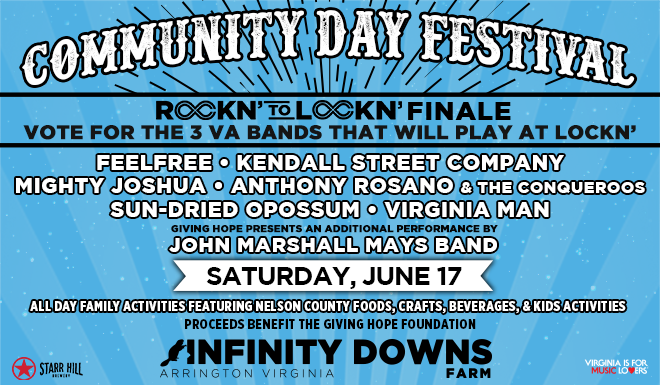 Community Day at Infinity Downs Farm is around the corner, and it’s a party that’s overflowing with music, food, beer, crafts, and good vibes! We’ve officially made it to the Rockn’ to LOCKN’ finale, and six bands are ready to battle it out for an exclusive spot on the LOCKN’ lineup! So now we leave the task to you, and every vote counts! Come one, come all, and join us at Community Day Festival on Saturday, June 17. Now let’s meet the bands that will be performing during the Rockn’ to LOCKN’ finale! Anthony Rosano and the Conqueroos are an energetic band that blend old-school blues with a modern rock sound. Voted “Best Blues” for 3 years in the VEER Music Awards, along with “Best Live Performer,” Anthony Rosano and the Conqueroos are a band that will put you in another world of overwhelming rock. If your taste in contemporary blues is filled with funky rhythms and explosive guitar work anchored by old school harp and lively vocals, this is your new favorite band. Born and bred in the cultural melting pot that is Washington D.C.’s metro area where people and music from all over the world interact daily, FeelFree’s music is a genre-bending sound. Blending reggae, rock, funk, and jazz influences, their live show “floats like a hummingbird and stings like a bee” with soaring, blues-tinged guitars over smooth vocal melodies amidst heavy grooves and huge horn-lines. Hailing from Fredericksburg, VA, Virginia Man is an indie-folk band quickly carving out a name for themselves with their seriously impressive musical chops. We’re really looking forward to watching them tear it up at Community Day!